The next FOMC meeting is set for April 26-27, and Money Morning Resource Investing Specialist Peter Krauth has shared the best investment to make ahead of the April meeting. After reading the minutes from the Fed's March meeting, it's very unlikely a U.S. Federal Reserve interest rate hike is coming this month. In fact, there's a greater chance – albeit a very slight one at 2% – of an interest rate cut at the conclusion of the April meeting, according to Bloomberg. 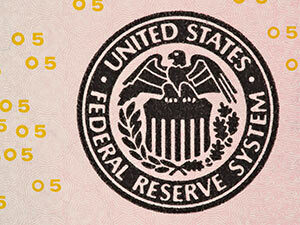 The Fed said last month that "a cautious approach to raising rates would be prudent." Policymakers said their biggest concern was that raising rates could signal a sense of urgency from the bank that wasn't appropriate. Then last week we saw uninspiring economic data on retail sales, industrial production, and consumer confidence. That leads many analysts to believe the Fed's dovish tone will continue. As the Federal Reserve mulls its next rate hike, the central bank is carefully monitoring the growing use of negative interest rates around the world. An estimated $7 trillion in government bonds across the globe currently yield less than zero percent, according to Barron's. That has increased worries about the global economy. And U.S. policymakers appear decidedly more dovish than in recent months. "Many participants expressed a view that the global economic and financial situation still posed appreciable downside risks to the domestic economic outlook," the March Fed minutes said. The Fed risks inflicting more pain on sputtering world economies by raising rates. Higher rates would send the dollar higher and impact global trade. The consensus is to expect the Fed to remain highly accommodative for longer. "So far all that's really done is boost stocks and buybacks to stratospheric levels, thwart the free market, increase wealth inequality, and saddle future generations with debt: a staggeringly expensive failure," Krauth continued. In this kind of environment, Krauth says investors need to look to tangible goods-physical goods that serve to preserve your purchasing power. Investors can do that with the PowerShares DB Commodity Index Tracking Fund ETF (NYSE Arca: DBC). This exchange-traded fund (ETF), which boasts a $2.13 billion market cap, offers an easy and affordable way to invest in commodities futures. The fund is made up of a basket of the most heavily traded and relevant physical commodities. The 14 commodities are aluminum, Brent crude, copper, corn, gold, heating oil, light crude, natural gas, gasoline, silver, soybeans, sugar, wheat, and zinc. The fund is heavily oil-weighted. Oil prices settled Wednesday at their highest close since Nov. 23. U.S. oil prices have risen 7.2% over the last two days, while Brent is up 6.7%. Meanwhile, gold is up 18.6% year to date, and silver is up more than 22%. In short, DBC gives investors access to crucial commodities without having to hold them. And that's a great investment to have before the April FOMC meeting when the Fed once again brings a dovish tone. After peaking in April 2011 at $31.90, DBC went on to slump 60% by last February as quantitative easing juiced markets and drained off capital. DBC has risen 7.2% in the last two-and-a-half months, and Krauth expects it will continue to climb as investors lose faith in paper assets and opt instead for hard assets. "Given the run-up in gold and silver, the inflation thermometer's mercury is on the rise," Krauth added. "And the worst kept secret in Washington, that Yellen is a Keynesian dove, has long been out." The possibility of a June Brexit (the UK leaving the European Union) and the upcoming U.S. presidential election are adding more uncertainty to markets. Those both further the case for holding hard assets.